The GAME National Championship is back with the second half of the tournament all ready to go. Excited? We certainly are. Here’s a quick reminder of where we left off. Aston Aunties have been the in-form team during the first half of the tournament, only losing three times enroute to 2nd and 1st in the autumn splits. “Forever Second” Birmingham Storm managed to win something other than a participation medal for the first time as they secured their first no.1 spot, but fell to the wayside a little in the second split. With Summer’s winners Huddersfield White and the widely regarded Grey Warwick breathing down their necks more uncomfortably than that guy in a queue who just does not respect personal space, the top two spots are far from safe. The Nottingham Krakens head up the Midlands Regional League along with Team Derby Knights. Teams from Aston University and the University of Birmingham look set to clash and show that it’s not just their top teams that have the fun, UoB Tempest and Team Aston looking to push things to the wire. There’s a tasty Sheff’s special as SHUrima and Sheffield 5 are set to serve up something tasty in their imminent derby games. No such thing as mediocre in the midlands. PJ Saltford continue to top the rankings along with the University of Liverpool Blue, Saltford having won the last regional final. Hull managed to smuggle two teams into the top bracket. The Scots are well represented with four teams in the top eight, UoE Blaze and UoD Blaze looking to give all 420%, Strathy v3 lying in 4th and St. Andrews Sinners in 7th heaven (hell was full). A story involving some Black Salami, Spank Boys, GangBangors and Bathkok sounds more like a rather edgy lads holiday that couldn’t quite make it to Thailand than a regional league lineup. Sorry to disappoint. Team Solent Mid head up the South-West and Wales Regional League with Bangor’s group activity enthusiasts a solitary point behind. There are three teams from Cardiff jostling for the top spots in a highly competitive league. Three teams have been sharing the top spot over the holidays and none of them seem happy about it, not to mention the two teams from Warwick hot on their heels. The Imperial Penguins remain in hot pursuit but whether the addition of Snowdown Bard helps them on their merry way is yet to be seen. PJ Saltford dropped out of the National League in the first set of relegations, but since then they’ve been immovable at the top of the North and Scotland Regional League. Bathing in the salt of their enemies’ tears, they finished the first half of the tournament strongly with a win in the Regional Final. Will they return to the hallowed National League? Only time will tell. The Aston Aunties have been the team to beat this year reaching both National League split finals so far, winning one. 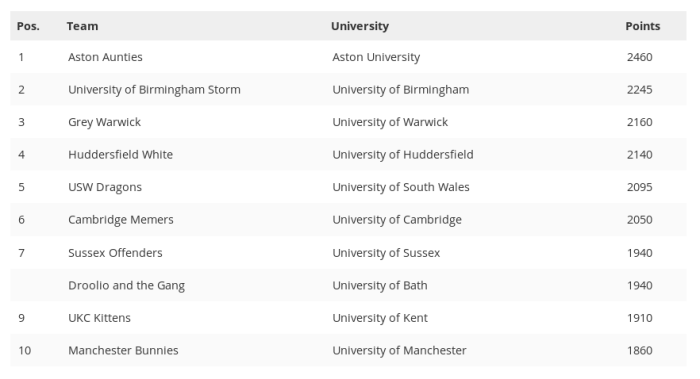 Although they let University of Birmingham Storm escape the meme ghost of tournaments past, they’ve been incredibly consistent. It’s going to be tough to knock them off the perch, though gale force winds may have a good shot. The winners of the Summer Tournament have been making strong headway, proving that their title is nothing to be sniffed at. Currently lollygaggin in a strong 4th, they’ll be looking to move onwards and upwards after a close final in Week 4. If you haven’t heard of this team, you haven’t been on the NUEL League of Legends group page enough. A big name on the scene, they’re notorious for their video editing skills. With a growing fan base that may soon exceed single digits these guys talk a big game, but can they back it up with results? All we know is that after their antics, they’ve got a lot to live up to. Win or lose, people will be watching intently. Well, following one more split (ie. two more weeks), the tournament enters its playoffs phase. The top two teams on championship points will automatically progress to the semifinals of the tournament. The top 30-40 points teams will be entered into the Wildcard Tournament. This year the Wildcard Tournament will be double elimination with teams with higher championship points starting in the winner’s bracket and earning byes into later rounds. Both the winner of losers and winners final will progress to the semifinals which will be held the week after and followed by the Grand Final. Meanwhile, with the regional leagues concluding, there will be four Regional Finals, one for each Regional League, teams with high Championship Points earning byes into later rounds. Correction Note: Fixed incorrect statement that the Nottingham Krakens were formerly known as the Nottingham Bears. *Better Read Than Dead have been moved to the National League as of Friday due to another team dropping out. Congratulations!